I had to groan inwardly when I read this section of an article on my local candidates' debate: When asked about his party’s plans to help youth joblessness, Terrence Young told the moderator, “I’m just going to change the subject a little bit” before launching into a critique of the Liberals’ drug policy. Never once when I've emailed Terence Young (my local MP) with concerns has he offered an actual response to the issues I've contacted him about. On each and every occasion his reply has instead told me what my concerns should be and/or has trotted out the official Conservative Party line. Stephen Harper must love this guy to bits. He's a faithful little Tory puppet with no thoughts of his own. Heck, he even looks much like a Harper clone. And, like Stephen Harper, he seems to have no understanding of the fact that elected officials' function is to represent and serve their constituents, not the other way around. With Harper playing divisive politics, fanning the flames of hate while paying lip service to gender equality when any Canadian who has been paying attention for more than five minutes knows that he couldn't care less about women's rights, our dishonourable Prime Minister seems to be hitting new lows daily. Like Greg Keelor of Blue Rodeo sings, "Sometimes I wonder, just how do you sleep?" I wonder, too, how Canadian voters let it come to this? The kind of nation I want to believe Canada is would have voted out such intolerance and small-mindedness the last time we were at the polls. In fact, by some measures they did -- a majority of Canadians voted for someone other than the Conservative Party in 2011 who only garned 39.6% of the popular vote. We desperately need new leadership in this country. We just as desperately need to rid ourselves of our antiquated (how did this ever seem like a decent idea?) first past the post electoral system. 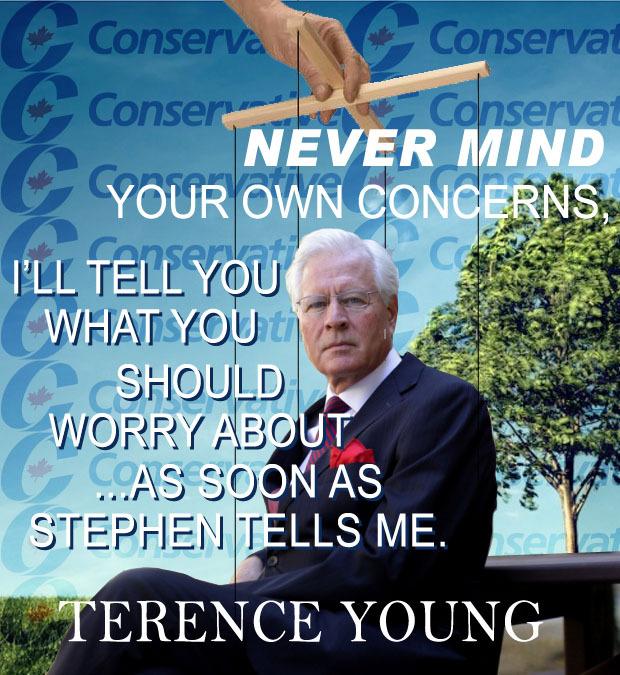 And Stephen Harper and Terence Young, no, I'm not letting you change the subject.